Concerning the recently detected huge trans-national drug ring in HCMC, the Investigation Police Department for Drug-Related Criminals under the Ministry of Public Security yesterday issued an urgent arrest warrant for Chinese ringleader Wu He Shan, 57, for further investigation. 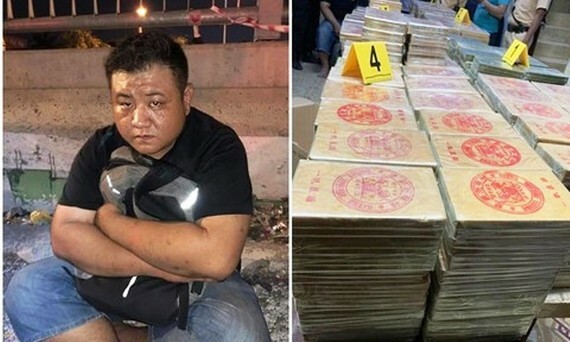 Police decided to carry out legal proceeding against Wu He Shan and his accomplices, including Vietnamese Thao A Do, Thao No Pao and Ly A Vu for bringing drugs into Vietnam and then transporting to another country. As Sai Gon Giai Phong Newspaper released, the Investigation Police Department for Drug-Related Criminals on March 20 discovered the cross-border drug ring and confiscated approximately 300 kilograms of crystal meth at An Suong Crossroads in HCMC. Eleven suspects in their bust on a large-scale drug ring comprising of eight Chinese, Vietnamese and Laotian nationals were arrested. The ring members have been smuggling narcotics from Laos into Vietnam via the Bo Y Border Gate in the Central Highlands province of Kon Tum for consumption in Ho Chi Minh City. According to Vietnam’s law, trading, trafficking, or storing over 100 grams of heroin is punishable with up to 20 years’ imprisonment, life imprisonment or capital punishment.